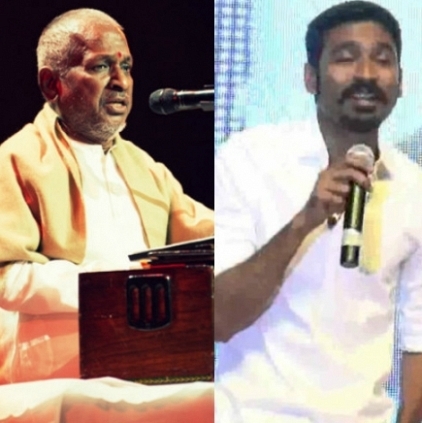 ILAYARAJA, DHANUSH AND THE EXPERIENCE CONTINUES! We all know that Dhanush looks at cinema very passionately and gives his best in whatever sphere he enters into. His National Award was a testimony to his acting prowess. He also writes lyrics and sings. His unique voice renders a different aural experience for the listeners. In a recent jamming video that he had shared in his social media page, the VIP actor is heard crooning along with singer Shwetha Mohan and music composer Sean Roldan, apparently for his directorial Power Pandi. The song was the evergreen hit Kaadhal Oviyam from Bharathi Raja’s Alaigal Oyvadhillai. It is a known fact that Dhanush is a huge fan of Ilayaraja and during a felicitation event for the maestro, he impressed the audience with an impromptu rendition of Naan Thedum Sevvandhi Poovidhu from Dharma Pathini. This even fetched a pat from Raja that Dhanush is a better singer than him. Even on a different occasion, the Aadukalam hero had sung Ilayaraja’s Thendral Vandhu Theendumbodhu in a popular TV show with so much of passion and life. Will we have some kind of a tribute to the Raaga Devan in Power Pandi, Dhanush's maiden directorial? Let’s wait and watch! Is movie watching going to be costly in Tamil Nadu? People looking for online information on Dhanush, Ilayaraja, Power Pandi will find this news story useful.